1. Get enough sleep – Sleep regulates your hormones and keeps your metabolism running the way it should. When you don’t get enough sleep, this can interrupt your body’s ability to regulate both. A decrease in quality sleep can decrease insulin resistance and increase appetite, too. Getting enough sleep is important to staying balanced and regulating your metabolism. 2. Add some spice to your meals – Want to rev your metabolism with something simple that you already have in your kitchen? Look no further than your spice rack and the cayenne and chili peppers! Cayenne increases thermogenic expenditure (which helps boost metabolism), it can increase fat oxidation (good for burning fat), and can curb your appetite. 3. Have a bit of caffeine – Caffeine is a great metabolism booster and is widely available. Caffeine from coffee can give your body the extra edge it needs before a workout, while increasing fat oxidation. Even better, drink oolong or green tea. On top of the caffeine, you also get a dose of catechins (powerful antioxidants) that can fuel your metabolism for a few hours after you consume them. As with coffee, make sure you’re consuming organic and ethically-sourced tea to avoid pesticides and unfair trade practices. 4. Incorporate HIIT training into your routine – High Intensity Interval Training has shown to have greater fat burning benefits when compared to steady state cardio. HIIT can create higher levels of energy expenditure for several hours after a workout. I developed my HIIT MAX program to get your heart rate up in very little time. It’s a complete workout in 25 minutes or less, and compared to doing steady state cardio, it keeps your metabolism going for hours post-workout, which can translate to greater amounts of fat burned throughout the day. 5. Eat potassium-rich fruits and veggies – Whenever you can fit in more fruits and vegetables, you should. Try to focus on those that are rich in potassium, as there’s a strong correlation between a higher lean body mass percentage and high consumption of potassium-rich fruits and vegetables. The findings suggest that diets with a rich abundance of these foods can relieve the acidosis (increased acidity) caused by the standard American diet, which can be inflammatory. Inflammation can cause imbalances in the body, and of course, can affect our weight when our bodies are not running in balance. Plus, vegetables and fruits with both soluble and insoluble fibre will keep your metabolism working properly and keep you fuller for longer. 6. Supplement with protein – You might already be eating clean protein, but it’s important that you’re getting enough. When you’re working out, getting enough protein is important for lean muscle gain. A high protein diet can benefit the metabolism, reduce fat, and help build lean muscles. In addition to your regular protein intake, you can supplement with a quality protein powder. This amazing information compiled by Michael Morelli was brought to the Phantom Forest Body Boma by www.mindbodygreen.com or @mindbodygreen for all your daily wellness, inspiration and health news! 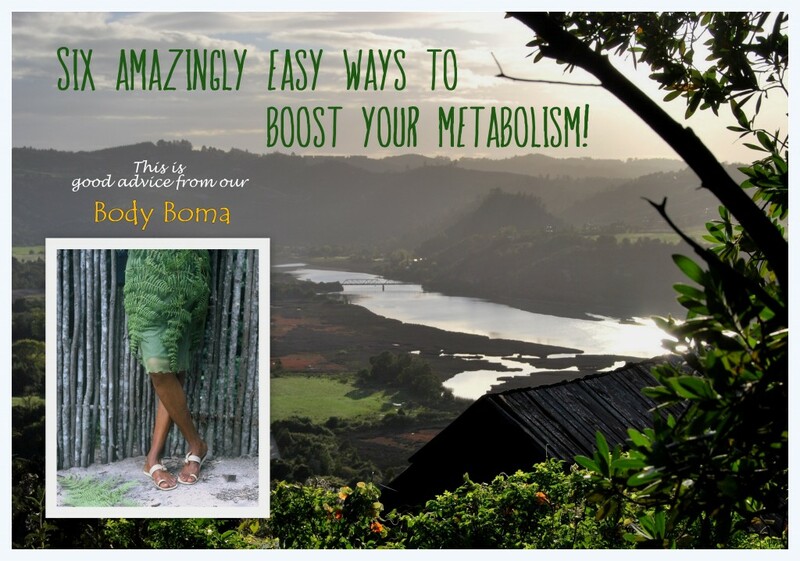 This entry was posted in From the Phantom Body Boma, Uncategorized and tagged Body boma, health, health benefits, metabolism. Bookmark the permalink. ← Never waste produce again. Your guide to the shelf life of fresh produce!